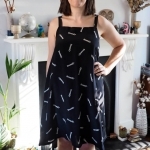 Firstly, please forgive me a little YAY – I won the Bloglovin’ 2015 award for Best Sewing Blog. I’m honestly amazed: against all the incredible blogs out there, never mind the other nominees, it’s a big surprise to be noticed and recognised like this. Thank you so much if you voted for me, and thanks even if you just visit and enjoy reading. Being able to share my garments and process makes sewing all the more enjoyable for me, so it’s great to have a little extra encouragement to keep on doing it. 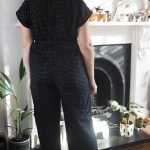 I trend to trust Style Arc’s drafting and fit on myself to cut their patterns straight into my good fabric, and this was pretty good out of the packet. It’s boxy and loose fitting (about 10″ ease in the chest in the size 10) but I think the design lines make it pretty flattering. 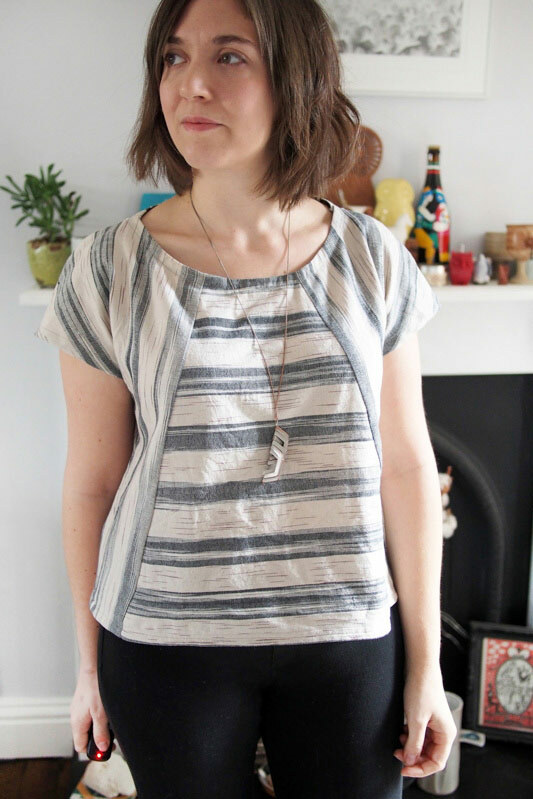 I scooped out the neckline a bit as the stripes seemed a bit overwhelming on the higher neck – as you can maybe see, that caused a tiny bit of gapeage so I’ll correct that on the flat pattern for next time. Also there’s an annoyingly uneven stripe right at the neckline which makes the neckline look slightly wonky – I swear it isn’t, ha ha. Due to my quite thick fabric, instead of using the included topstitched facings around the neck, arm and hem I just did a bias facing for the neck and plain hems. But in a lighter fabric I’d definitely like to try that detail next time. I cut the side panels slightly off-grain so they’d follow the diagonal front seams, and I like the resulting chevron effect at the sides and shoulders. It does appear to tip up just a bit at the front, I am not too sure how to correct that. Love how the stripes are positioned! What a great little top. And congrats on the award! I’m so glad a down to earth, every day clothes making sewing blog won out. Very inspiring! Thanks Lisa. Who knows how or why they noticed me, but it’s nice anyway! Well done on your bloggers award! The first of many…. Really lovely and a well-deserved WIN! Congratulations on the award! 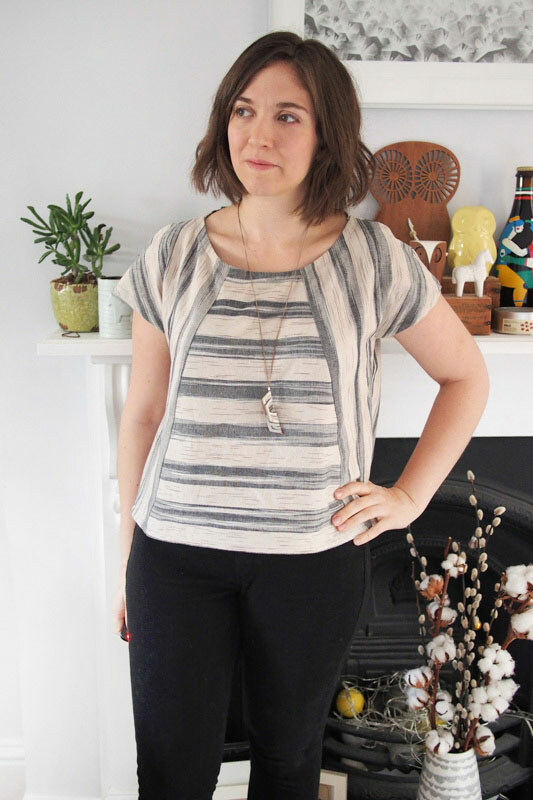 I think the Ethel top is such a great shape and yours looks lovely. 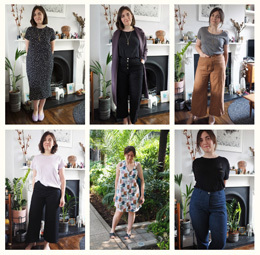 I’ve only just discovered Style Arc but I think I’ll be trying some of their patterns this autumn/winter. Thanks Jane. I love Style Arc, they are superbly drafted even if the instructions are a bit sparse. 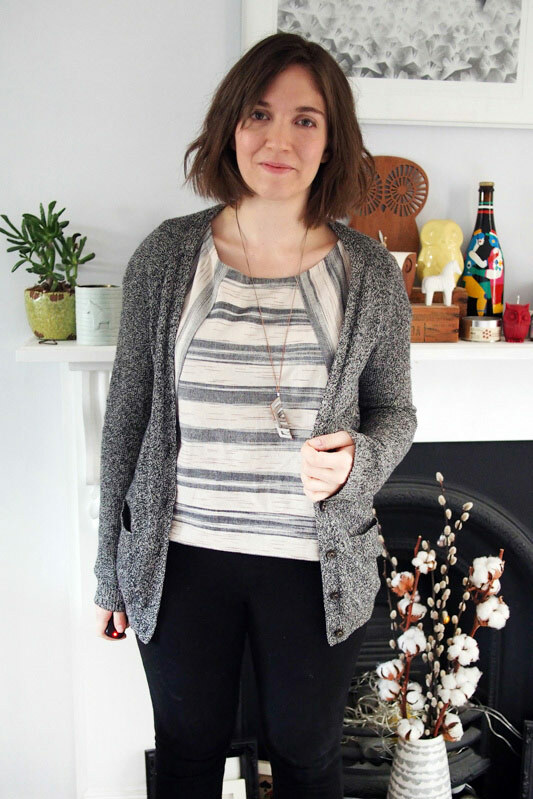 So excited for your bloglovin’ award – congrats!! 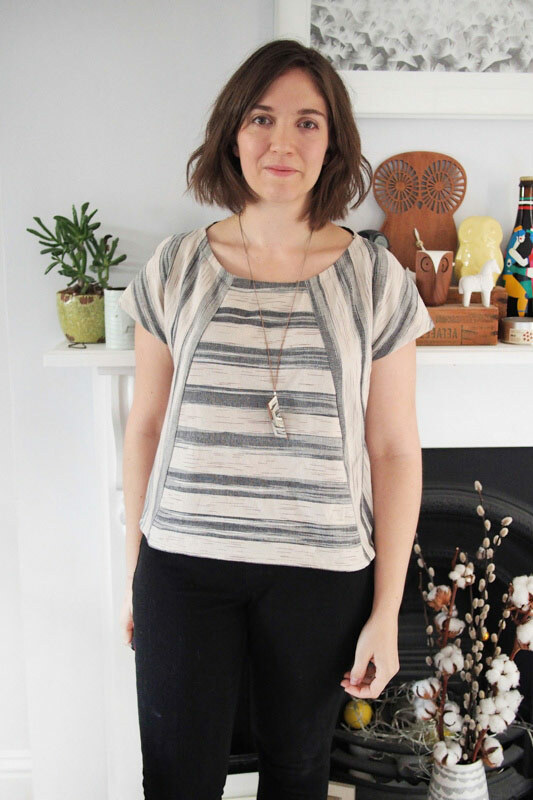 And I’m thrilled to see your Ethel top – I really love the fabric and the stripes matching the lines of the pattern. I’ve never actually tried a Style Arc pattern, but maybe I should be giving them a go! Thanks Katie! I love Style Arc, if you can get past the poor instructions – the styles and drafting are great. This is really cute! Well done!!! I loove your top! That fabric and the way you’ve used it in the pattern are great. Perfect combo. And congrats on the blog award. Congratulations!!! That is very exciting. I love this top. The contrast stripes give a basic shape some real interest. Love it! Thanks Kat, I’m pleased it came together how I planned in my head. 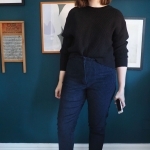 I love the new top – so versatile and fits so nicely in your fall capsule wardrobe. Thanks! I think it will indeed. This is a beautiful top and it really looks great on you. The stripe placement is very pretty! Congrats on the award, I love reading your blog. Thank you Yoshimi, I like yours a lot too! Congratulations on winning the bloglovin award!!! Huge congratulations on the win Katie! You mentioned the front hem of your top – which is lovely by the way – tipping up slightly. Does it feel like it’s slipping back off your shoulders? I sometimes get that and have discovered that a forward shoulder adjustment corrects it. Ahaaa. I think that could be it – you can see the weighting is a bit off at the shoulder line too. I’m going to try that. Thanks! Thanks Amanda! 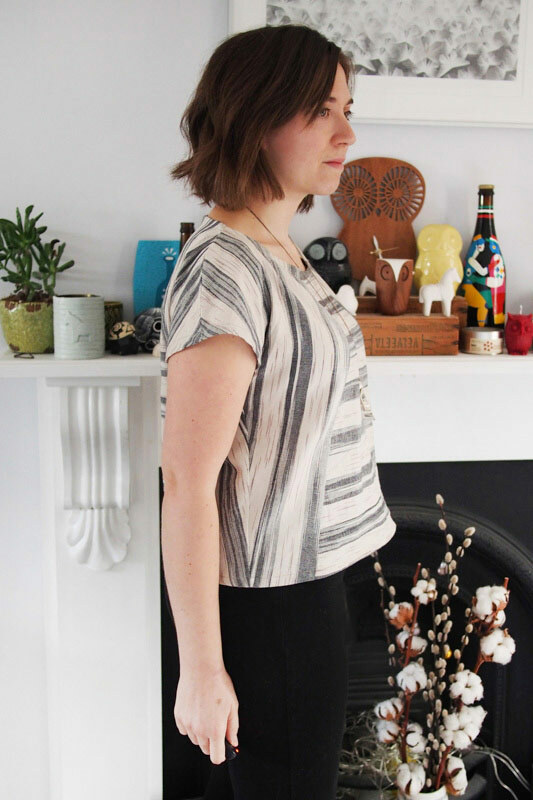 Excited to sew more ‘special basics’ like this. That’s super news about your award. Congratulations. And loving the Ethel – great style lines indeed. Thanks Sarah! So much scope for stripe and pattern blocking with this pattern. Congratulations for winning! I agree with you that the top looked amazing with a grey cardigan. I hope you don’t mind me asking what is the type of cloth you used for the top? I will try to find inspiration from your top and what I learned from ACS Daily. Congratulations on the win Katie!! I love your new top and the stripes look awesome! Congratulations! I love your top. Congrats on the award! Ooh, I am a sucker for anything ikat. Love the idea of playing with the stripe direction. Congratulations Katie!!! I love reading your blog and learn a lot from you. Love this top!! Stripes look great. Think I may need this pattern! Blushing! And I look forward to seeing it! Wow, this is truly inspiring. Big congrats!!!! Great top, I love your use of stripes. Really nice top! you’re lucky you made the version without the facings though, they’re a bit of a pain to topstitch, especially the bottom one which is a bit shorter than the top where you topstitch – argh! Bagging and pleating ensues! Well done on the win :). Ahh I hate doing stuff like that so I’ll gear myself up if I come to make the facing version some time!